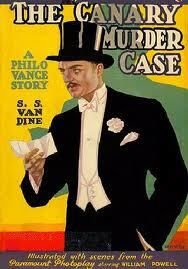 In all of mystery, no major writer has fallen from grace as completely as S.S. Van Dine, the creator of Philo Vance. In the late 1920s and into the 1930s, Van Dine was one of the most popular and successful writers around, in or out of the mystery genre. The public demand for his aristocratic amateur detective seemed insatiable, both in book form and on movie screens. Then, in a plummet almost as dramatic as the rise, it was over a scant quarter-century later. “Philo Vance needs a kick in the pance,” famously needled Ogden Nash, but he got much more than that; he also got cast into obscurity. How could one of the mightiest fictional sleuths of the 20th century fall so far, so fast? To understand the life and times of Philo Vance, one must first understand those of his creator. 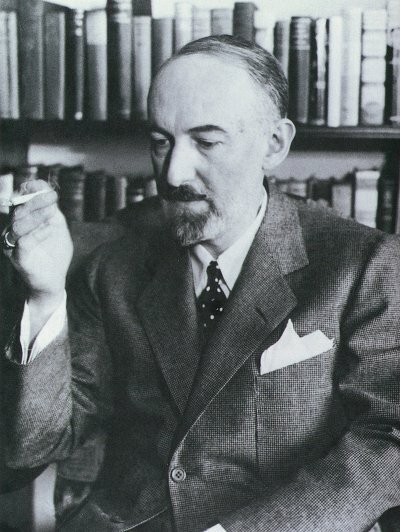 S.S. Van Dine was the pseudonym of Willard Huntington Wright, a man who was every bit as superior-minded as his creation. Born in 1888, Wright was a youthful prodigy with a devotion to Nietzsche. He forged his literary credentials as an art and drama critic, and worked briefly as editor of The Smart Set, a would-be trendsetting publication created by the iconoclastic writer H.L. Mencken and the powerful critic George Jean Nathan. But Wright tended to dabble more than achieve, and by early middle-age his pretensions far outweighed his accomplishments or income. One innovation of Wright’s was to also give the name S.S. Van Dine to the first-person narrator of the books, a trick that would later be be used in a similar way by Ellery Queen. Even the name Philo Vance is a pseudonym. The real detective, we are told, has only permitted publication of his solutions to “impossible crimes” on the condition of anonymity. Whatever his true name, the wealthy dilettante lives in a posh two-floor apartment on East 38th Street in Manhattan. When not hobnobbing with his personal lawyer Van Dine whom he calls “Van,” or helping New York District Attorney John F.X. Markham, and the bluff, boneheaded Sergeant Heath of the homicide department keep their jobs, Vance spends his time studying art and aesthetics. Educated in Europe, he still carries the mannered speech of an upper-class Englishman, habitually referring to his colleagues as “old thing” or “old dear,” and punctuating nearly every other sentence with “don’t y’know.” The monocle-wearing Vance is remarkably indolent and frequently yawns his way through conversations. In truth, about the only thing that saves him from total insufferability is a droll sense of humor. This air of condescension is not surprising since Vance appears to be an authority on every subject on the face of the earth, knowledge that he shares with his associates at every opportunity. In solving crimes, however, he puts more stock in understanding a suspect’s personal psychology than he does in picking up tangible clues. “When material facts and psychological facts conflict, the material facts are wrong,” he blithely tells Markham. Punctuated with frequent footnotes and elaborate diagrams, the Philo Vance novels were well-crafted puzzlers that captivated readers. The first two, 1926’s The Benson Murder Case (which was trumpeted by Scribner’s with the ad line, “At Last—A Detective Story for the Intelligent!”) and 1927’s The Canary Murder Case, were based on real crimes: the 1920 unsolved murder of stockbroker Joseph Elwell and the 1923 killing of Dorothy King, also known as the “Broadway Butterfly,” respectively. Benson sold well, but it was Canary that launched the Philo Vance phenomenon, selling 60,000 copies in its first month and making Willard Wright a wealthy man. Vance’s enormous popularity can be gauged by how quickly Hollywood beckoned. Out of all the classic sleuths created by American writers, only Charlie Chan has appeared in more films than Philo Vance. Dapper, mustachioed William Powell was the first and best portrayer of Vance, offering a pleasing characterization that was high on charm but low on the superciliousness of the print detective. He would play the role four times, from the first Vance film, 1929’s Canary Murder Case, to the best one, 1934’s The Kennel Murder Case. Other Hollywood Vances would include the manor-born Basil Rathbone, the incongruously Slavic Paul Lukas, and the proletarian Alan Curtis. Meanwhile Wright continued to grind out novels: The Casino Murder Case in 1934, The Garden Murder Case in 1935, and The Kidnap Murder Case in 1936, but public tastes were changing. It may have been the harsh realities of the Great Depression which made the idle, rich antics of Philo Vance seem less amusing, or simply that readers were turning instead to the talented likes of Hammett, Cain, Gardner, and Stout. Whatever the reason, by Garden, sales were dropping severely. puzzlers. 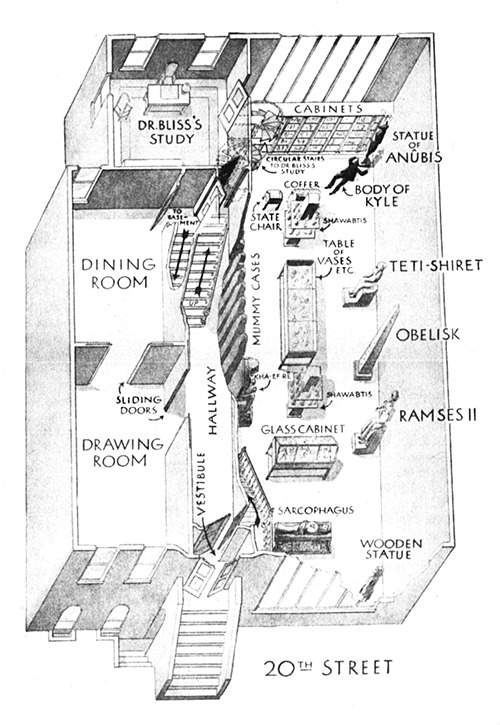 Diagram from The Scarab Murder Case. Vance appeared in only two more books: The Gracie Allen Murder Case (1938), the only one to break the title formula, and The Winter Murder Case (1939). Both had actually begun as treatments for Hollywood vehicles, the first for radio comedienne Gracie Allen (George Burns' other half) and the second for ice skater-turned-movie-star Sonja Henie. Wright later novelized the scripts, inadvertently pioneering the concept of the movie tie-in. Both books were poorly received. Wright died in 1939, before the publication of Winter, and the Philo Vance phenomenon was over. There would be a handful of films yet to come, but increasingly they turned the dapper aesthete into just another B-movie gumshoe. There were a couple of stabs at a Philo Vance radio series as well, a brief one in 1945 with Jose Ferrer, and a longer-lived one that began in 1948 starring radio utility actor Jackson Beck, but these also bore little resemblance to the source. While virtually forgotten today by the public at large, there is no question that Philo Vance had a big influence on the detectives who were to follow, probably none so much as Ellery Queen (though the Manhattan-flavored eccentricities of Nero Wolfe also faintly echo Vance). The earliest version of Queen, which mystery authority Francis Nevins calls “Ellery I,” is a complete pastiche of Vance in all respects, down to the formulaic titles, the narrator-as-author gimmick, and the nearly insufferable nature of the character. Queen, however, evolved with the times, something that Vance was never quite able to do. It takes a bit of work to hunt down a Philo Vance novel today, even at the library. If one takes the time, one will discover that the clever plots continue to hold up, though Wright’s beloved psychological deductions are often shaky and Vance himself comes off more as a satire than a serious character. But the works of S.S. Van Dine serve to transport the reader back to a long-gone era of society and style of writing. They spotlight a moment in time when one writer had exactly the right idea at exactly the right time, and made hay, blissfully unaware of how rapidly the sun would set.